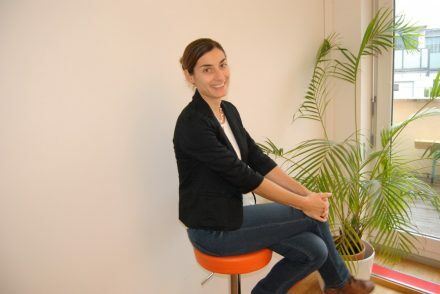 Angelika Kneidl is a founder of accu:rate GmbH. Founded together with Florian Sesser in 2016 in Munich, the startup for the simulation and analysis of people flow has been supported by bootstrap financing so far. We wanted to find out how Angelika ended up starting her own company after completing her doctorate in computer science, what motivates her and about the secret weapons she brings along. After my dissertation, I was not quite sure what I should do. The topic of my dissertation — the simulation of pedestrian flows — was incredibly exciting, but I wasn’t interested in a university career. So that left me with three options: either look for a new subject area, find a company that works in the field or found something myself. Because I had attended a business plan course during my dissertation, I was already in contact with UnternehmerTUM. So I decided to stop by there to get some advice. They told me about options for establishing a relatively risk-free spin-off. No, not really. But I constantly meet amazing and inspiring people who in their own way contribute to me being able to continuously evolve, and I am able to learn from them and continue to grow. I think I’m someone who can be unbelievably tenacious and can always push my limits and go beyond them. That’s very helpful when starting a company. At the same time, it’s also somewhat dangerous because I forget to take care of myself and my private life. I think superlatives are tough… I make mistakes regularly. But I also learn an incredible amount from them. For example at the very beginning, we relied heavily on remarks made by potential clients who we were friends with. They gauged the market potential as many times greater than it actually was in the beginning. I learned in that case that you have to be careful if you want “objective” market assessments from well-meaning clients. I don’t think I have one… I think having a good attitude and being inquisitive and open-minded always works well! To be honest, I often forget there’s a difference between male and female founders. The times I do become aware of it are when there are special programs for female founders, which I like to participate in. Female friends of mine who are founders have also relayed that they weren’t taken seriously by customers. That — thankfully — has never happened to me personally. I was just recently in Taiwan — it’s a beautiful island that I would really recommend visiting!